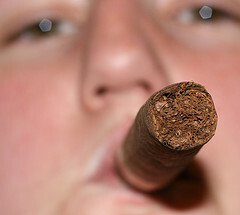 Passing along pointers to novice cigar smokers is one of our major goals at StogieGuys.com. So, with that in mind, here are a few new tips to help you enjoy this beloved hobby even more. A clip tip. If you’re smoking a cigar with short or mixed filler—more or less the scraps from the long-filler typically used in high-end cigars—don’t use a guillotine cutter on the head. Instead, try a V-cut or a punch. By creating a smaller opening on the cap, you’ll lessen the likelihood of bits of tobacco coming off on your lips or tongue. Sweet success. Sometimes a cigar will land a punch with a heavy dose of nicotine. You may get a headache, feel a bit woozy, or get slightly sick to the stomach. The typical recommended remedy is sugar, which supposedly counteracts the nicotine. (I can’t vouch for the science, but it seems to work pretty well.) My suggestion is to get the sugar from a small glass of orange juice. Not only is it fairly healthy, citrus is also a nice way to cleanse your palate. Tools you can use. We passed this tip along a year ago, but it’s worth repeating. The tiny screwdriver that comes in eyeglass repair kits can come in handy for adjusting lighter flame heights and depressing the nozzle to drain the butane take before refilling. Another inexpensive item worth picking up is a large eyedropper sold in drug stores to help with measuring medications. It’s useful in refilling humidification devices with distilled water. I'd like to second the tip about punch cutters with mixed filler cigars. I've been using a punch cutter with some Grand Habano 3 Siglos Fumas and it makes a world of difference. Regarding the nicotine punch, try drinking a glass of chocolate milk. You'll get the sugar counter-affect but the chocolate milk coats the palate and also compliments just about every cigar finish. Chocolate milk! That's a really interesting idea. I don't think I've had chocolate milk in 50 years so. I'll have to give it a try.